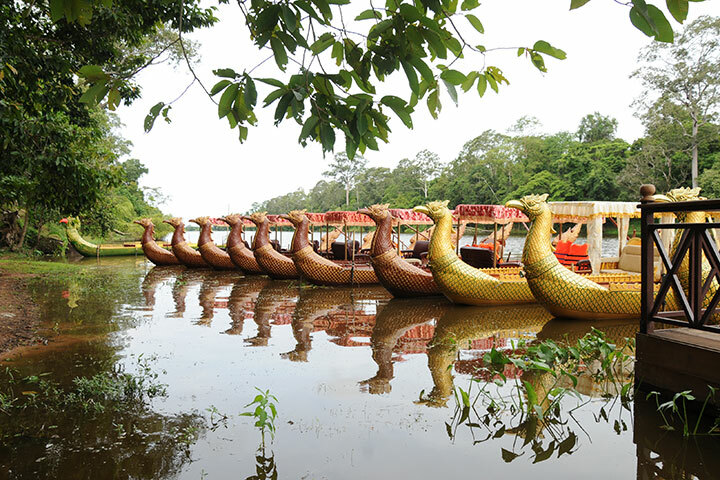 Hop on board for an unforgettable culinary expedition to Cambodia and Singapore! Explore sacred temples and indulge in the finest cuisine on this once-in-a-lifetime gourmet trip! *Due to the extreme volatility of the Rand against all major currencies, the rates quoted are indicative and can change at any moment – final rates can only be confirmed upon receipt of full payment based on that day’s rate of exchange. Assemble at OR Tambo International Airport where you will be assisted with check-in formalities by a Travel League representative. Depart Johannesburg on Singapore Airlines. Arrive in Singapore and remain in transit. Depart Singapore on Singapore Airlines for your flight to Siem Reap, Cambodia. Arrive at Siem Reap International Airport where you will be welcomed by your Cambodian local guide and transferred to your hotel. Immigration Police meets the group in the arrival hall and assists with visas and immigration formalities. Deluxe Arrival Transfers from Siem Reap International Airport to hotel. Duration of transfer from airport to hotel approximately 20 minutes. Upon arrival at the hotel, you will be welcomed and offered tea/coffee and refreshments/snacks. As your rooms will not yet be ready, luggage will be stored with the hotel concierge, and delivered to your rooms as soon as they become available. International check-in time is approx. 14h30/15h00. We will endeavour to get you to your rooms as quickly as possible. Unwind after your long flight with an Absolute Sensory Experience at the top spa in Siem Reap. Duration: approx. 2 hours, including transfers and a 1 hour spa treatment – 12:30 pm to 2:30 pm. Visit one of the most relaxing places in Siem Reap: the Bodia Spa. This spa is dedicated to pampering both body and soul using only natural, Cambodian-made products. 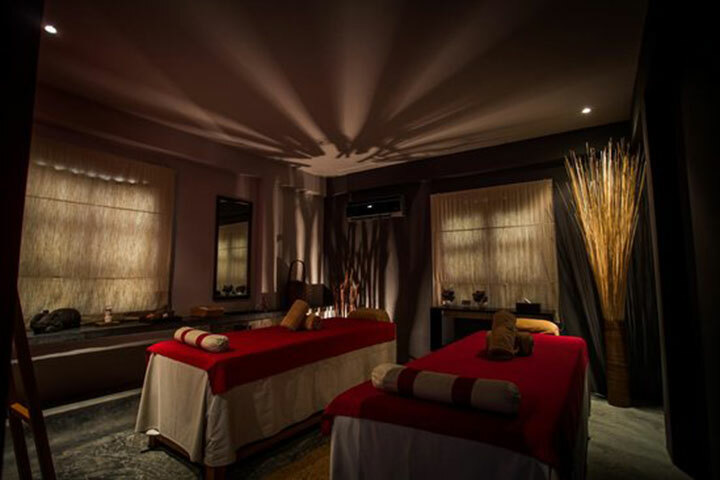 You will have the choice between traditional massages, such as foot reflexology, a head, back & shoulder massage, Bodia Tonic or an Aromatherapy Massage. 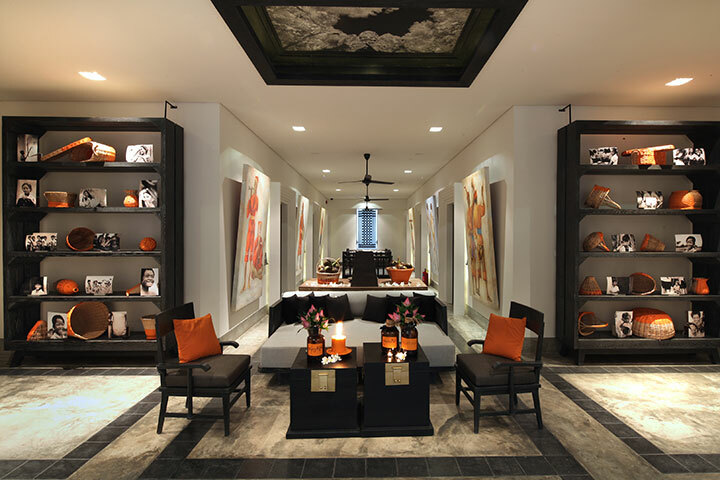 Return to the hotel after your luxurious treatment for check-in procedures. The balance of the afternoon will be at leisure to unwind and relax at the hotel or begin exploring Siem Reap under your own arrangements. Dinner will be taken at the Chanrey Tree restaurant. Duration: approx. 2.5 hours, including transfers – 6:30pm to 9:00pm. You will be collected from your hotel and transferred to the Chanrey Tree Restaurant for a sumptuous dinner. Relax in its cosy and welcoming dining room. Chanrey Tree is Siem Reap’s finest and most authentic restaurant, serving a delicious à la carte and chef’s tailor-made degustation menu with a unique traditional Cambodian cuisine. With classic appetisers like chicken and banana blossom salad, and main courses featuring frogs’ legs, Khmer beef, and roast chicken cooked with traditional local spices, this restaurant is part of an emerging trend of eateries offering a high-end twist on local fare. Overnight in Siem Reap at the Shinta Mani Resort or similar. The Shinta Mani Resort is a newly renovated boutique property centrally located in the leafy French Quartier between the Royal Gardens and the Old Market Area, just 15 minutes from the Angkor Wat Temples. The courtyard-style resort’s 62 rooms & junior suites enjoy a surprisingly different “Bensley twist”, with direct access to, or first floor balcony views of, the stunning swimming pool and flourishing tropical gardens. All rooms are decorated with mirrored feature walls, custom-designed iron beds and handcrafted light fittings. Additionally, rooms feature artwork created exclusively by Bensley Design Studios, Bangkok for Shinta Mani Resort. 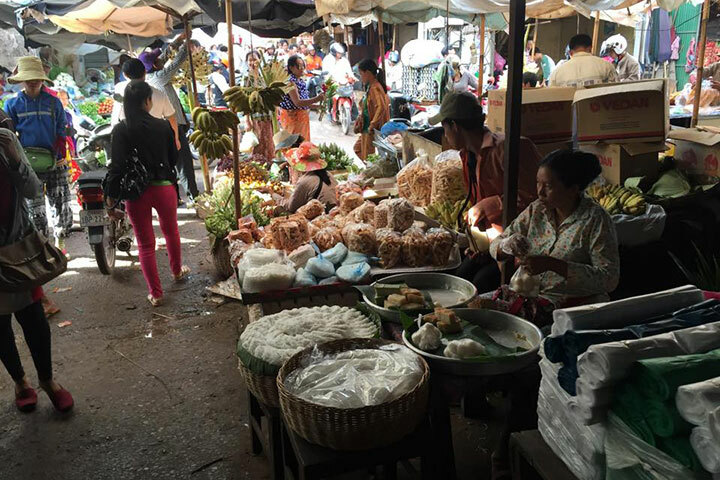 Half-day cooking class will begin with a hotel pick-up by remork (Cambodian tuk tuk), followed by a visit to one of the busiest local markets in Siem Reap for supplies, then on to the restaurant to enjoy your cooking class. It can be hot work in the markets, so a cold welcome drink will be served on arrival. 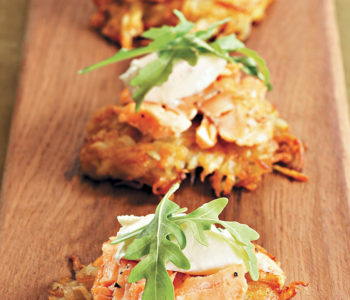 The chef then provides a full introduction of all ingredients in their raw form and then usually you produce two dishes. Enjoy lunch at the end of the class. Balance of the afternoon at leisure. You will be collected from your hotel at approx. 7pm and transferred to the Abacus Restaurant for dinner. 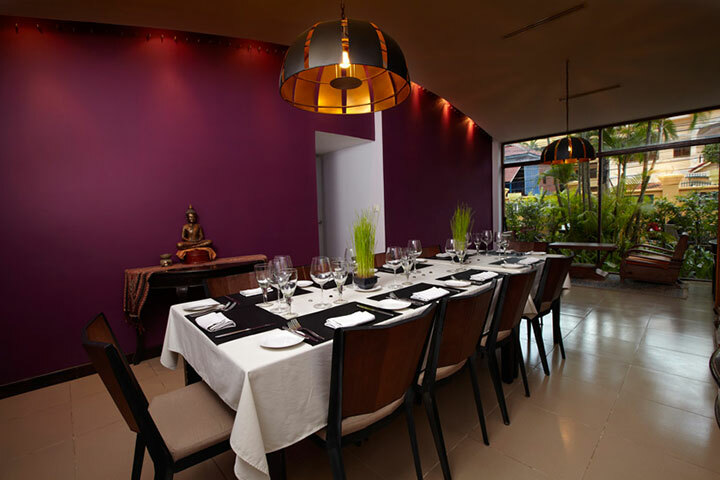 A lovely French restaurant set in a modern Khmer house surrounded by a lush garden. It boasts a luminous air-conditioned dining room, an alfresco terrace, and a secluded private dining room for smaller groups. 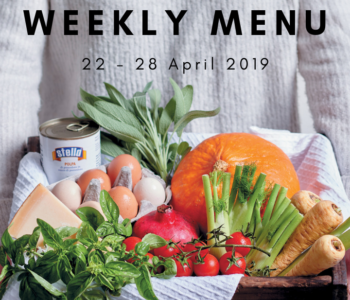 The menu offers a varied selection of upscale Western comfort food such as grilled lamb with rosemary, T-bone beef steak, duck in mango sauce and home-made desserts or ice cream. Light breakfast at the hotel. You will be collected from your hotel thereafter and will begin exploring the magnificent sights of Cambodia! Morning Sunrise Tour at Angkor Wat and Ta Prohm (including breakfast at Angkor Café) and a visit to Senteur d’Angkor shop. Early morning, around 5am (sunrise) after a light breakfast at the hotel, you will be transferred to visit Angkor Wat, the largest temple in the world, with a volume of stone equalling that of the Cheops pyramid in Egypt. 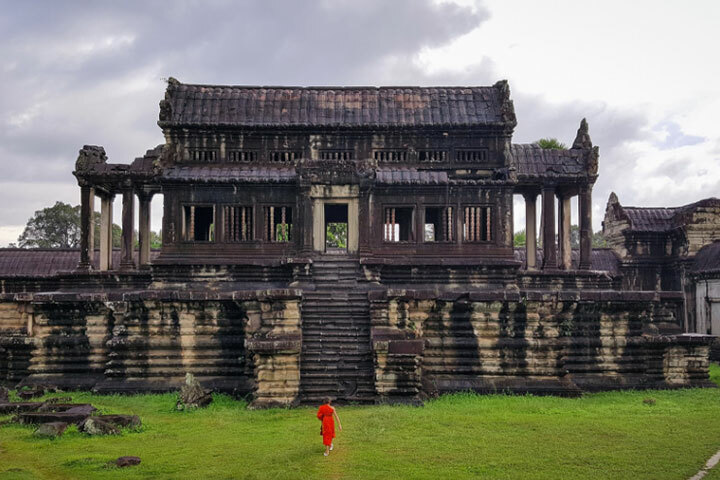 It is unlike all the other Khmer temples in that it faces west, and is inspired by 12th Century Hinduism. Its symmetrical towers are stylised on the modern Cambodian flag. Conceived by Suryavarman II, Angkor Wat took an estimated 30 years to build. It is generally believed to have been a funeral temple for the king. 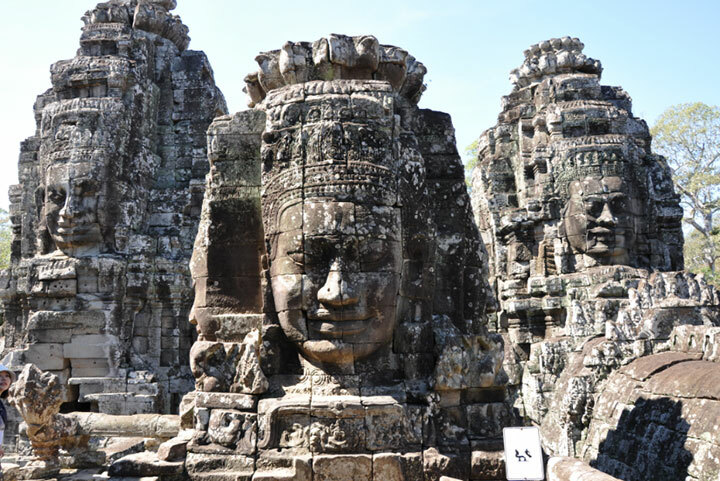 Angkor has been occupied continuously by Buddhist monks and is extremely well preserved. Intricate bas-reliefs surround Angkor Wat on four sides. Each tells a story. The most celebrated of these is the Churning of the Ocean of Milk, which is located on the east wing. In this story, the Naga serpent is twisted by demons and gods, eventually spurting out the elixir of life. 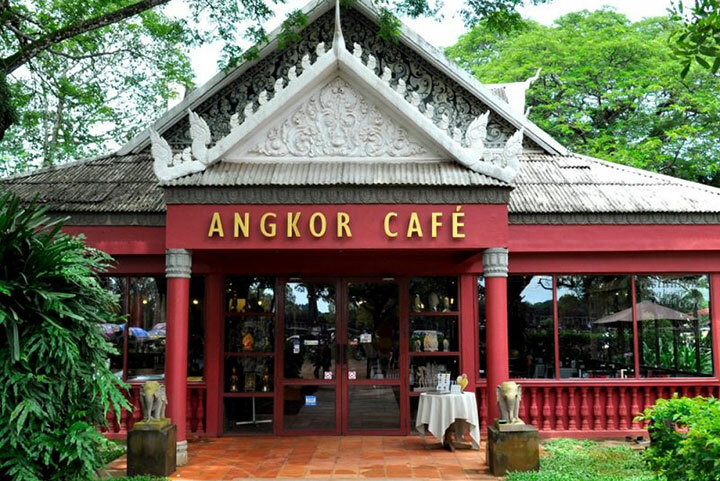 Continue after sunrise and touring at Angkor Wat to Angkor Café Restaurant for breakfast. The only air-conditioned restaurant in the Angkor park facing Angkor Wat! Tasty food, lovely atmosphere and a great garden terrace on which to enjoy the breeze. 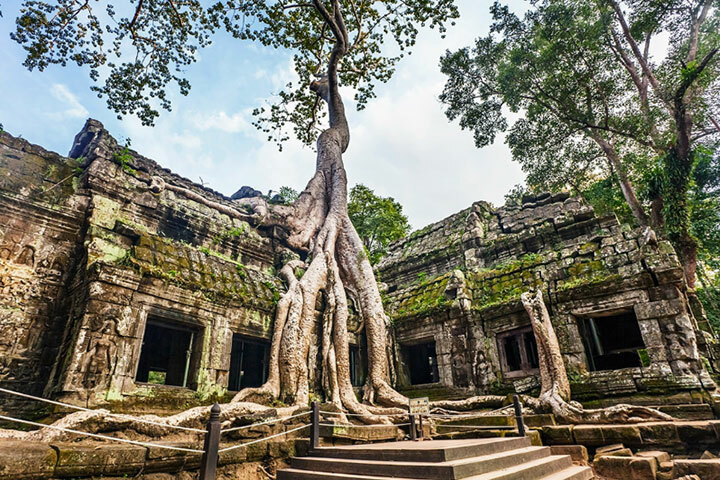 Continue to Ta Prohm, the ‘Jungle Temple’ that has been left largely in its natural state since its ‘re-discovery’ by French explorers. Surrounded by jungle, its labyrinth of stone hallways is overgrown with the roots and limbs of massive banyan trees, which envelop the stone like tentacles. Ta Prohm is one of the largest temples in Angkor, dedicated in 1186. The moment you step into the Senteurs d’Angkor shop, you are immediately struck by an explosion of the senses with heady aromas floating from every corner. It can be difficult to choose which kind of scent you prefer, so you can start with an everyday indulgence by trying the coconut oil-based handmade soaps. Available in a variety of scents, including jasmine, orchid, cinnamon, lemongrass, green tea, mango, lotus and orange, the soaps are all made by hand, using traditional techniques and extracts derived exclusively from plant oils and 100% natural ingredients. Here you will have your first chance to sample and purchase the world-renowned Kampot pepper. This setting is the perfect spot on Earth, devotees say, to yield a product they describe in rapturous vocabulary usually reserved for fine wines. “Aristocratic, virile, almost aphrodisiacal,” with subtle notes of caramel, gingerbread and mild tobacco. Celebrity chefs from Paris to Los Angeles swear by ‘Kampot pepper’, a southwestern Cambodian spice with a tragic history, that is now reclaiming its global pre-eminence. It is also proving to be ‘black gold’ for some of its once-impoverished farmers, thanks in part to Kampot pepper being awarded a Protected Geographical Indication by the European Union last year. This award identifies unique products like Stilton cheese, Champagne or Darjeeling tea, as originating in a very specific region. Cambodia’s Kampot Pepper is regarded as one of the finest peppers in the world and once you’ve experienced its elegant flavours and opulent aroma, you’ll wonder how you ever enjoyed other peppers! Green pepper: Harvested while still young on the vine, Kampot green pepper aromas explode on the palate with a very mild pepperiness. This fresh pepper accommodates a grilled squid dish perfectly. Black Pepper: Kampot black pepper delivers a strong and delicate aroma. Its taste, which can range from intensely spicy to mildly sweet, reveals hints of flower, eucalyptus and mint. 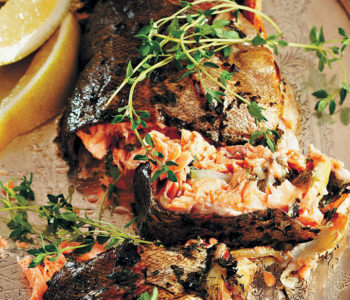 This black pepper suits all kind of dishes and distinguishes itself in particular with grilled fish. Red pepper: This disconcerting pepper allows for the wildest combinations, from venison meat seasoning to vanilla desserts. Harvested when the berry is fully mature on the vine, Kampot red pepper delivers a powerful and fruity aroma. Its taste combines the spicy, mature flavour of black pepper with a sugary sweetness. White pepper: Kampot red and white peppers are extremely rare due to the difficulty in harvesting fully mature peppers. Only a few hundred kilos are produced each year. Obtained by soaking the red berries in water for a few days, Kampot white pepper develops an intense bouquet and delicate aroma. Its strong spicy taste carries notes of fresh grass and lime. Travel through the thriving countryside, past rice paddy fields and local villages, to the northeast of Siem Reap. 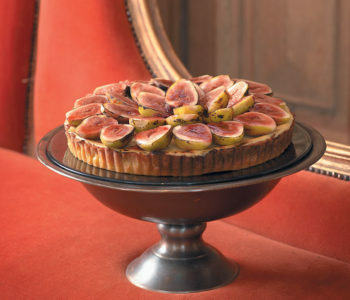 Your tour guide will stop to show you the various fruits and foods grown along the way. On arrival at your traditional wooden house & working farm, the owner will take you on a tour of the locally grown Dragon Fruits and to meet with the villagers. After touring at the farm, you will be invited to have lunch at the Khmer traditional house. Embark on a unique tour by Khmer traditional boat within the Angkor Archaeological Park, while sipping on a refreshing beverage and enjoying some delicious canapés along the way. Depart in a gondola boat from the South Gate and enjoy drinks and cocktails on board. This is a quiet ride, far from the crowds, allowing you to enjoy a landscape where history and nature merge and melt into one another. Dinner under your own arrangements, giving you the option to explore local dining at its best. Free time at leisure until your departure. Departure transfers from hotel to Siem Reap International Airport. Deluxe Arrival Transfers from Changi Airport (Singapore) to hotel with sightseeing and lunch en-route. En-route to your hotel, enjoy a tour to Chinatown with a stop at an authentic Chinese Tea House for a demonstration and tea tasting as well as a hearty lunch. Duration – approx. 4.5 hours including transportation, visit to Chinatown, Chinese Tea workshop and lunch – 2:30pm to 7pm. On arrival in Chinatown, enjoy lunch at the famous Chinatown Food Street – a cash allowance will be handed to you on site for you can dine as you wish! A fascinating tour of the immensely popular Tiong Bahru Market & Food Centre, well known among local foodies. 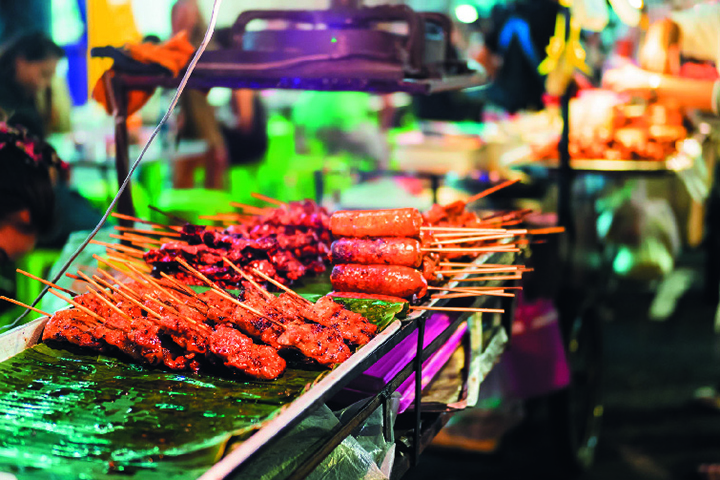 Discover the crazy varieties of Singaporean street food, which seems to know no limits. Gain an in-depth understanding of Singapore’s street food culture and learn the origins of local-style kopi (coffee), become acquainted with the intricate local coffee lingo and enjoy a cuppa. Savour some morsels of local street delights and enjoy opportunities to buy and sample more street food in a city where food safety is strictly regulated. Explore the bustling Waterloo Street open-air market teeming with vendors of widely diverse wares, located in front of two busy temples. Literally rub shoulders with the local market-goers in the chock-a-block Albert Centre Dried Seafood/Dried Foodstuff Market to marvel at the endless varieties of foodstuff which never fail to surprise. Thereafter, explore the streets of Little India by trishaw. Enjoy lunch and dig into a traditional pot of curry in an authentic Indian restaurant. This tour will include: transfers, local guide, food sampling in the programme, trishaw ride, set lunch at the Song of India. The Michelin-starred The Song of India is the ultimate in luxurious fine dining for modern Indian cuisine in Singapore. Located just a stone’s throw from Orchard Road, in a classic black and white heritage bungalow, it forms the setting of grand opulence and sophistication with its stylish interiors and lush green surroundings. Prepare for a gastronomical journey through India with its award-winning cuisine. Since opening its doors in April 2006, The Song of India has established itself as one of the most iconic restaurants in Singapore, and has garnered numerous awards. Chef Manjunath Mural has created a show-stopping pan-Indian menu, which criss-crosses the sub-continent’s regional cuisines. Here you’ll find melt-in-the-mouth Keralan-spiced lamb shanks, tandoori prawns bathed in a pomegranate marinade, and the Lucknavi classic of Gilawat kebabs: pan-seared ground lamb patties perfumed by cardamom, ground rose petals and raw papaya. Balance of the afternoon will be at leisure. You will be collected from your hotel later in the evening and transferred to the Red House Restaurant at Robertson Quay. Established in 1976, Red House is a seafood restaurant specializing in Asian seafood dishes and Singaporean favourites. Red House had its beginnings as a family restaurant in a red colonial house along Upper East Coast Road. Red lanterns lined the façade of the restaurant and over time, customers grew to identify Red House by its grand lanterns. Not only are the lanterns a physical feature of the restaurant, they symbolise light and good fortune – both of which are auspicious for commemorating reunions. Similarly, the Red House logo comprises of two rice bowls (forming the shape of a lantern) and alludes to the coming together of families and friends over good food. Having built a solid reputation for quality seafood, the new outlets at Prinsep Street and Robertson Quay have earned a strong following amongst locals, expatriates and tourists. At Roberston Quay, guests can enjoy communal dining in an open space that faces the iconic Singapore River. This dinner includes: transfers, local guide, set dinner at the Red House restaurant. Overnight in Singapore at the Hotel Jen Tanglin Singapore Grand or similar. The full day will be at leisure for last-minute shopping. A late check-out from the hotel, at 12pm, will be arranged. Please leave your luggage with the hotel concierge, who will store it on your behalf. Please return to the hotel at approx. 5pm to collect your luggage. At approx. 5:30pm you will be collected from your hotel and transferred to the Bar and Billiard Room at the Raffles Hotel to enjoy a famed Singapore Sling (please note the Raffles Long Bar will be under restoration over this period and will re-locate to the Bar and Billiard Room). Regarded as the oldest existing bar in its original location in Singapore, Bar & Billiard Room is an institution within Raffles Singapore. It occupies a standalone building built in 1896, and was the first in the country to have a female bartender stirring up a storm in the 1920s. Inside, chandeliers hang down from the high ceiling and the floor tiles are replicas of the original. One of the five original billiard tables from the turn of the century can be found there, where guests are welcomed to play a round or two. Picturesque windows look out to the thick surrounding foliage, punctuated by elegant cast-iron frames that compose the terrace. The Singapore Sling is one of those wonderful cocktails that we have all probably heard of, but perhaps never drunk. And because this recipe is often incorrectly recorded in most recipe books, even if you think you’ve had it, you probably haven’t. One of the key and often overlooked ingredients in this drink is Benedictine. While the resulting flavour is not overly predominant, it does add a certain taste profile that would be totally missing without this secret ingredient. After enjoying your Singapore Sling, you will be transferred to the IndoCafe restaurant for dinner, before being transferred directly to the airport for your flight to Johannesburg. The dinner includes: transfers, local guide, one Singapore Sling, set dinner at IndoCafe. Conveniently located at the fringe of the city central, easily accessible to and from the local expressway network, and the world famous Orchard Road shopping belt, premium and business class hotels and Singapore’s Central Business District. With its unique old colonial house exterior, The White House has easily become a great spot for holding all sorts of events such as private lunches, dinners, product launches, intimate gatherings and so on. At IndoCafe, Peranakan cuisine is served, infused with a contemporary touch, fresh spices and fundamental ingredients. Transfer directly to the airport immediately after dinner. 2:10am Depart Singapore on Singapore Airlines. Programme inclusions are subject to availability at the time deposits are paid and final services confirmed. Travel League and its suppliers reserve the right to amend the final programme logistics – minor changes can be made at any time and we will advise you accordingly. Such minor changes may be made by our suppliers without prior notice. Every effort is made by Travel League to adhere to the proposed itinerary, however, we reserve the right to make the changes to your travel arrangements when it becomes necessary to do so.